This week as Belgium and the rest of Europe was battered by Siberian winds, I’ve enjoyed thinking about peach blossoms and pink confections. March 3rd is celebrated in Japan as Hinamatsuri, also known as Girl’s Day or Doll’s Festival. Starting in February, families with daughters put up elaborate platforms representing the imperial wedding, complete with the emperor, empress, court ladies, famous poets and musicians of the Heian era (794-1192). These doll sets are usually given by grandparents to their granddaughters as they wish them health and happiness. Since most Japanese live in tiny, cramped apartments and doll sets cost around $2000, only a few still keep to the old customs. Nevertheless, girls are still feted on this special day. The reason I enjoy Hinamatsuri is not for the dolls but the flowers and food. March 3rd is known also as Momo no Sekku, the festival of peach blossoms. Peach trees blossom even before spring makes its first claims, and the flowers are as beautiful as they are symbolic–delicacy need not come at the expense of resolve. The fragrance of peach blossoms has a hint of bitter almond and creamy jasmine, but it’s fresh and bright. The pale color of flowers inspires the meals served on Hinamatsuri, like chirashi zushi, a bed of vinegared sushi rice scattered with raw fish, salmon roe, egg threads and pickled lotus root slices, or hishi mochi, diamond shaped rice cakes in delicate pastel shades. My other favorite is sakura mochi, glutinous rice cakes filled with red beans and wrapped in a salted cherry leaf. Jean Patou is relaunching three fragrances from its archives: Adieu Sagesse, Amour Amour (now called Deux Amours), Que Sais-Je? The perfumes were originally created in 1925 and were to represent three phases of love, seduction, doubt and abandon. In-house perfumer Thomas Fontaine brought them back, along with the earlier reissues of Chaldée, Eau de Patou and Patou Pour Homme. Adieu Sagesse created by legendary perfumer Henri Alméras is a floral blend dominated by gardenia. It includes notes of jonquil, lily of the valley, neroli, carnation, tuberose, opopanax, civet, and musk. Deux Amours (formerly Amour Amour), a classical floral bouquet, was created by Georges Reboul and Henri Alméras. It features notes of bergamot, black currant, narcissus, neroli, carnation, jasmine, rose, and vetiver. Que Sais-Je?, another Alméras perfume, is a classical chypre. It includes orange blossom, apricot, peach, carnation, iris, jasmine, rose, amber, cistus labdanum, and civet. So, you’ve worn fragrances in the days when the dangers of oakmoss didn’t occupy the bright minds in the EU’s governing bodies. Perfume to you means character and statement, not something that smelled blindly could be mistaken for shampoo or a flavor compound mistakenly rerouted from a candy factory. Or you simply love scents that have curves and glamour, just like the stars in your favorite black-and-white films. Well, I have three words for you–Jean Patou Mille. Or let’s just make it a number–1000. 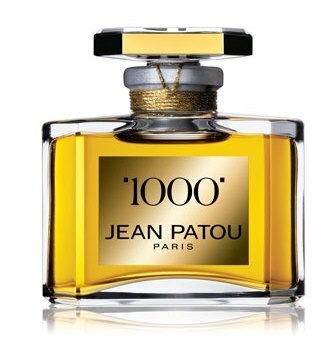 Although Jean Patou’s fame owes much to its 1930s bombshell Joy, 1000 is my favorite from the collection. It packs as much old-school glamour as a reasonable person could take, but that’s what makes it interesting. You can certainly find plenty of dramatic perfumes with a touch of vintage glamour, from Chanel to Frédéric Malle, from Guerlain to Parfums de Nicolaï, but 1000 holds its own next to No 5, Hermès Calèche and Madame Rochas. Cologne was never one of my favorite fragrance types. You see, when you start out exploring perfume, citrusy blends (eaux de cologne) are suggested on the grounds that they’re “fresh and easy to wear.” Except that I found most colognes to be neither. They smelled either too dry, too sharp or evoked an unfortunate association with furniture polish. I admired the ease with which some women could douse themselves in Hermès’s Eau d’Orange Verte and project an aura of casual elegance, but for quick refreshment, I reached for either light florals or green perfumes. What changed my mind about colognes was Christian Dior’s Eau Sauvage and Jean Patou’s Eau de Patou. Much has been written about Eau Sauvage, one of the most revolutionary fragrances in recent history, but Eau de Patou has kept a lower profile. Perfumer Jean Kerléo created it in 1976, and when you smell the original version, it’s remarkably modern and luminous with its generous dose of sheer floral notes wrapped around classical bitter citrus and moss. A touch of sweetness takes the sharp edge off the lemon and lavender, and the drydown of damp woods and powdery amber is comfortable and graceful.